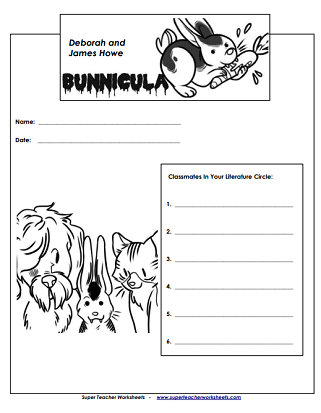 The printables on this page are designed to go along with the book Bunnicula, by Deborah and James Howe. Worksheets include reading comprehension questions, literature circle role sheets, a word search puzzle, writing prompts, a character list, and other printable activities. Check your students' reading comprehension with these questions about chapters 1 and 2. Includes a matching section with character names and questions about the Monroe's unusual trip to the movie theater. The picture shows Mr. Monroe walking into the house carrying a small bunny. He is dripping wet from the storm. Harold is looking towards him curiously. Students reflect on which parts of the story are realistic and which parts are fantasy. 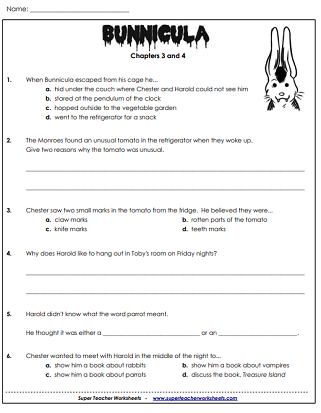 This worksheet contains questions about Bunnicula's late-night escapes, Harold's relationship with Toby, and Chester's meeting to discuss vampires. This illustration shows Mr. and Mrs. Monroe, Pete, Toby, Harold, and Chester looking at a white tomato on the kitchen tomato. Students choose three humorous parts of the story and explain why they're funny. This page has comprehension questions about the mysterious white tomatoes, Chester's dramatic warning to the family, and Chester's plan to kill the vampire. In this picture, Chester the Cat is trying to drive a steak (stake) through the bunny vampire's heart. Students must explain which character, in their opinion, is more intelligent: Harold or Chester. This sheet has questions about Bunnicula's sickness and how Harold helped to bring a happy ending to the situation. In this picture, Bunnicula is standing next to a salad bowl, about to have his first meal in a long time. Students are instructed to tell whether or not they think Bunnicula is harmless or a threat to the Monroe family. Tell which character is the speaker for each quotation from the book. Students choose one project to demonstrate their understanding of the book. This page contains a list of characters from the book, including Mr. and Mrs. Monroe, Toby, Pete, Chester, and Harold. Find these hidden words in the puzzle: Monroe, bunny, salad, garlic, stake, cage, vegetables, fangs, Chester, Harold, movie theater, and nocturnal. Here is a set of four bookmarks featuring the Bunnicula rabbit. Write several open-ended discussion questions about the assigned chapters. Write a short summary of the assigned chapters. 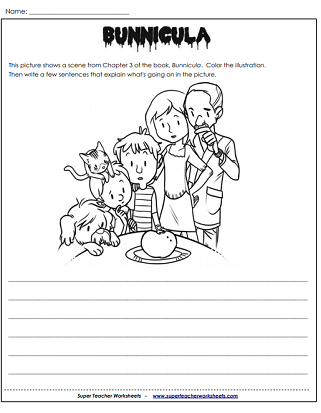 Draw a detailed picture of one scene from the reading assignment. Choose several tough words from the reading and use a dictionary to define each one. Make connections between events from the story and real-life. Here's a cover page for your Bunnicula literature circle packet. See the full list of titles for which we have chapter book worksheets. This page has worksheets and activities to go along with the book, Frindle, by Andrew Clements.